This classic Carne Asada Mexican recipe is bursting with flavors. Tender sliced beef marinated in a creamy Hellmann's® or Best Foods® Real Mayonnaise base and seared to perfection. 1 Combine Hellmann's® or Best Foods® Real Mayonnaise, vinegar, cilantro, lime juice, garlic, jalapeño pepper, ground cumin and sugar in large bowl; stir in beef. Cover and marinate in refrigerator 1 hour. 2 Remove beef from marinade, discarding marinade. Heat oil in large nonstick skillet over medium-high heat and cook green peppers and red onion, stirring occasionally, until almost tender, about 5 minutes. Add beef and cook over high heat, stirring frequently, until beef is done, about 4 minutes. 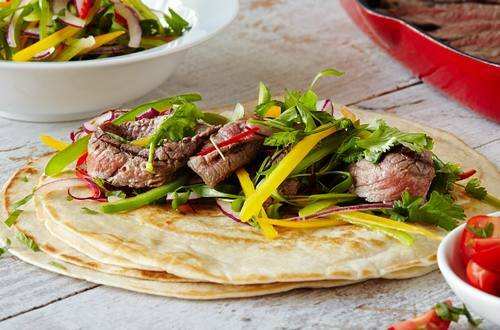 Serve beef and vegetables in warm tortillas and garnish, if desired, with additional cilantro.